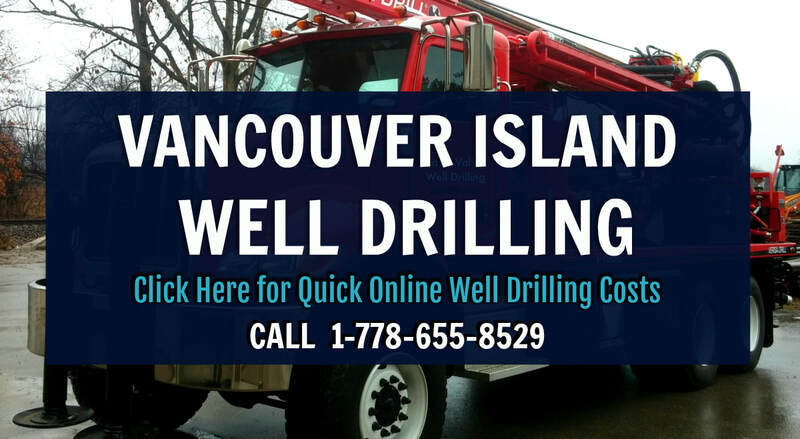 Vancouver Island property owners have full access to the Vancouver Island Well Drilling Regulations and the 2018 well drilling costs without the need for a high-pressure sales visits from a well drilling company. This FREE service will provide you a guideline for the cost to drill a well on Vancouver Island or the Gulf Islands. Please provide your information in the well drilling cost estimate request form. We request information so we can better provide a detailed Vancouver Island well drilling cost quote. Thanks, you'll from us shortly! Please submit your information, we'll respond quickly. Your information helps up provide a more complete and detailed well drilling estimate for the Langley area.... thank-you! Approximately when are you expecting to drill a water well? Sometimes wet weather seasons can make if more difficult for site access. How is the property currently serviced for water? Are there any existing wells? Vancouver Island Well Drilling Regulations and Water Well Bylaws information is available to residents of Brentwood Bay, Campbell River, Courtenay, Cedar, Cobble Hill, Colwood, Coombs, Cowichan Valley, Crofton, Duncan, Errington, Ladysmith, Langford, Nanaimo, Nanoose Bay, Parksville, Qualicum Beach, Port Alberni, Saanich, Sooke, Shawnigan Lake, Sidney, Victoria, Westwold & Yellow Point and other areas of the island. Water wells on the island provide industries, municipalities, farms and homeowners with access to groundwater resources to meet domestic and non-domestic water requirements throughout the island communities. Well Drilling Regulations for Vancouver Island states that water wells must be constructed and maintained to ensure that the groundwater supply is safe from pollution, and the possibility of wasted water is minimized. The BC Groundwater Protection Regulations protects groundwater quality and quantity by setting strict-standards for the construction and maintenance of water wells including drilled water wells on the island. Requiring qualifications for well drillers on Vancouver Island as well as local well pump installers, requiring most water wells be constructed by qualified well drillers who are registered with the province. The Groundwater Protection Regulations also distinguishes between well related activities that may be conducted by the water well owner or a property owner, and all other water well activities that must be performed by qualified well drillers, qualified well pump installers and Vancouver Island Water Well professionals. 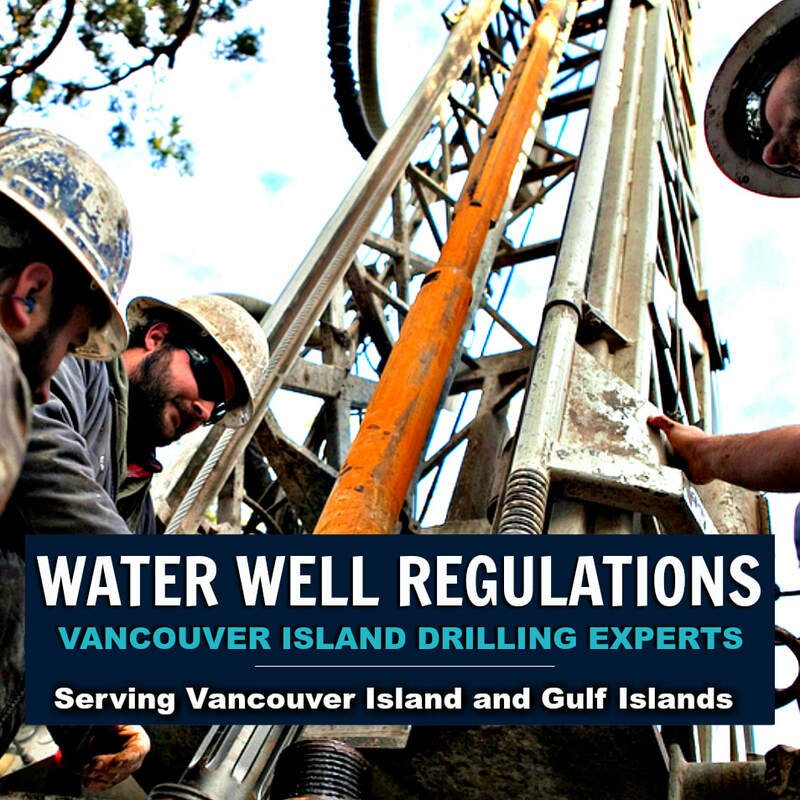 Vancouver Island Well Drilling Regulations resource page provides links for groundwater resources, aquifers, local well drilling, well drilling costs, water testing, well pump and water well repairs. There are additional water well protection resources including VHIA. The Vancouver Island WELLS Database is a large resource of local water well information including registered island water well reports, groundwater and aquifer data for the area. It allows public access to search the BC well maps for water well data. Search or upload drilled well data to the BC Gov Wells Database for Vancouver Island. 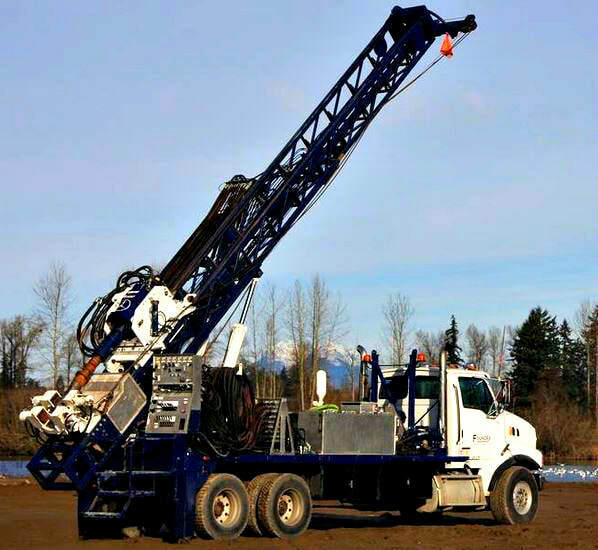 Scroll down the page for Langley Well Drilling Regulations and WELLS BC Database search tool. The BC Water Resource Atlas and the WELL Database BC user guide provides a detailed explanation to locate data for registered water wells. Registering an existing Langley water well is not a legal requirement, it's done so on a voluntary basis, as a result not all water wells in Langley will be located in the WELLS BC Database system. Drilling and decommissioning of water wells, and installing well pumps in Langley is a restricted activities that must be performed or directly supervised by qualified water well people who are registered with the province to work in B.C. The well drilling cost on Vancouver Island will be largely determined by local well drilling experience. Knowledge of the island is important to successfully complete drilled wells. Expert well development is crucial for long lasting well wells and to manage the well drilling cost on Vancouver Island and the surrounding communities. Always avoid drilling excessively deep when possible, hire a local well driller who has the expertise to prevent water well problems when constructing water wells. Search Water Well Regulations and FAQ for Brentwood Bay, Campbell River, Courtenay, Cedar, Cobble Hill, Colwood, Coombs, Cowichan Valley, Crofton, Duncan, Errington, Ladysmith, Langford, Nanaimo, Nanoose Bay, Parksville, Qualicum Beach, Port Alberni, Saanich, Sooke, Shawnigan Lake, Sidney, Victoria, Westwold & Yellow Point. There are several possible approaches when searching the WELLS BC Database for relevant Vancouver Island water well information or a specific water well. Utilize Report #1 or Report #7 if you currently have a Well Identification Plate Number or a Well Tag Number. Use Report #2 if you just have access to basic information or facts with reference to a certain water well, such as the legal description of a property. Not all water wells are drilled deep on the island, many wells are much less than 200' in depth, if located near a possible source of contamination a well can become contaminated and potentially cause serious illness. The regulated BC Ministry of Environment water well set-backs are in place to protect water wells from becoming contaminated from many possible sources. For comparable water well drilling depths in your Island community neighborhood and Ministry of Environment set-backs please refer to all local resources including well drilling reports, resources are available at British Columbia Water Well Search. When drilling for water on Vancouver Island it's important to be up-to-date with relevant local bylaws and other well drilling regulations. Some possible sources of water well contamination would include waste discharge to the ground, such as a privy vault (also known as an outhouse or pit toilet), cesspool (“overflow” pits), underground storage or fuel tanks, septic tanks an septic-fields, stable or pig-sty, manure heap, fertilizers and pesticides, run-off from urban areas, a cemetery or landfill sites etc. A drilled well on Vancouver Island or on the surrounding Gulf Islands should be located on higher-ground when feasible to protect the well head from normal or seasonal flooding and possible surface drainage. Shallow wells and even deep drilled wells located in any of the Vancouver Island communities may be vulnerable and should always be located away from surface drainage ditches and other potential sources of contamination. Vancouver Island Well Pump are the Island's Well Pump Specialists providing Submersible Pumps, Booster Pumps, Centrifugal Pumps, Deep Well Jet Pumps, Constant Pressure Pump Systems, Shallow Well Jet Pumps, Irrigation Pumps, Sump Pumps, Sewage Pumps to the Vancouver Island & Gulf Island communities. Well Pump Vancouver Island service area includes Brentwood Bay, Campbell River, Courtenay, Cedar, Cobble Hill, Colwood, Coombs, Cowichan Valley, Crofton, Duncan, Errington, Ladysmith, Langford, Nanaimo, Nanoose Bay, Parksville, Qualicum Beach, Port Alberni, Saanich, Sooke, Shawnigan Lake, Sidney, Victoria, Westwold & Yellow Point. Vancouver Well Pump services the Gulf Islands. Vancouver Island Well Pump has fully-stocked water well vehicles, well pump installers and complete service departments available on Vancouver Island. Well pump contractors with complete inventory of well pumps and water system components to handle well pump installations and well pump repairs on Vancouver Island.